^ "U.S. civilian arrested in fresh Okinawa DUI case; man injured". The Japan Times. 26 June 2016. Archived from the original on 31 July 2017. Under a decades-old security alliance, Okinawa hosts about 26,000 U.S. service personnel, more than half the total Washington keeps in all of Japan, in addition to base workers and family members. ^ a b Oda, Shizuo (March 2003). "Yamashitachō dai-1 dōketsu shutsudo no kyūsekki ni tsuite (山下町第１洞穴出土の旧石器について)" [Paleolithic Artifacts Excavated from Cave No.1, Yamashitachō Site]. Nantō Kōko [南島考古] (in Japanese) (22): 1–19. Archived from the original on 2007-10-12. 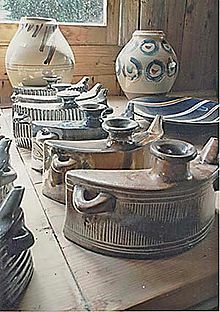 ^ Higashionna, Kanjun (東恩納 寬惇) (1957). 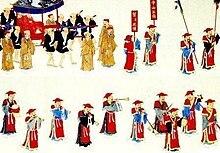 Ryūkyū no rekishi [The History of Ryūkyū]. Nihon rekishi shinsho (in Japanese). Tokyo: Shibundō. p. 13. Retrieved 2018-02-14. ^ Takemoto, Masahide (1972). Shinzato, Keiji, ed. "Kōkogaku no shomondai to sono genjō" [Challenges in Archaeology and the Present Condition]. Rekishi-hen. Okinawa bunka ronsō (in Japanese). 1. OCLC 20843495. ^ Wampler, Robert A. (1997-05-14). The National Security Archive, The Gelman Library, ed. "Revelations in Newly Released Documents about U.S. Nuclear Weapons and Okinawa Fuel; NHK Documentary". George Washington University. Retrieved 2018-02-11. ^ "Memorandum, Ambassador Brown to Secretary Rogers, 4/29/69, Subject: NSC Meeting April 30 - Policy Toward Japan: Briefing Memorandum (Secret), with attached". 1969-04-30: 1. Retrieved 2018-02-11. 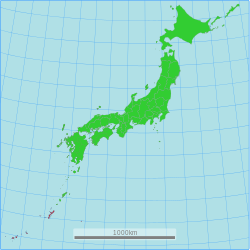 ^ "NSSM 5 - Japan, Table of Contents and Part III: Okinawa Reversion (Secret)". 1969: 22. Retrieved 2018-02-11. ^ "Memorandum of Conversation, Nixon/Sato, 11/19/69 (Top Secret/Sensitive)". 1969-11-19: 2. Retrieved 2018-02-11. ^ Journal, The Asia Pacific. ""Herbicide Stockpile" at Kadena Air Base, Okinawa: 1971 U.S. Army report on Agent Orange | The Asia-Pacific Journal: Japan Focus". apjjf.org. Retrieved 2018-11-15. ^ Norris, Robert S.; Arkin, William M.; Burr, William (November 1999). "Where They Were" (PDF). Bulletin of the Atomic Scientists. 55 (6): 26–35. doi:10.2968/055006011. Archived (PDF) from the original on 2013-06-23. ^ a b ROBERT TRUMBULL (1 August 1965). "OKINAWA B-52'S ANGER JAPANESE: Bombing of Vietnam From Island Stirs Public Outcry". The New York Times. Retrieved 27 September 2009. ^ a b Steve Rabson. "Okinawa's Henoko was a 'Storage Location' for Nuclear Weapons: Published Accounts". The Asia-Pacific Journal: Japan Focus. 11 (1(6)). Retrieved 14 January 2012. 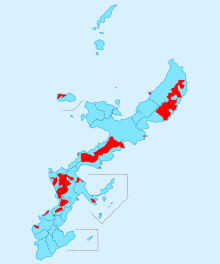 ^ Reversion to Japan of the Ryukyu and Daito Islands, official text. 1973. Retrieved 2014-08-05. ^ "語り継ぎたい「沖縄戦」". Okinawa Times (in Japanese). 13 May 2007. Archived from the original on 30 September 2007. ^ Cox, Rupert (2010-12-01). "The Sound of Freedom: US Military Aircraft Noise in Okinawa, Japan". Anthropology News. 51 (9): 13–14. doi:10.1111/j.1556-3502.2010.51913.x. ISSN 1556-3502. ^ "Okinawa US base move in doubt after governor elections". BBC News. BBC. 16 November 2014. Retrieved 17 November 2014. ^ Steven Donald Smith (April 26, 2006). "Eight Thousand U.S. Marines to Move From Okinawa to Guam". American Forces Press Service. DOD. Retrieved 1 August 2014. ^ "Marines' Exit May Take Till '15: U.S.". Kyodo News. Japan Times. 9 November 2008. ^ Mitchell, Jon (2012-08-19). "Rumbles in the jungle". The Japan Times Online. ^ Mie, Ayako (2016-07-22). "Okinawa protests erupt as U.S. Helipad construction resumes". The Japan Times Online. ^ "Lawsuit Seeks to Halt Construction of U.S. Military Airstrip in Japan That Would Destroy Habitat of Endangered Okinawa Dugongs". Center for Biological Diversity. 31 July 2014. Retrieved 2 August 2014. ^ "Gyokusendo Cave". Japan-guide.com. 2013-05-29. Retrieved 2014-08-05. ^ "Establishing World-Class Coral Reef Ecosystem Monitoring in Okinawa". Okinawa Institute of Science and Technology Graduate University. 2013-09-05. Retrieved 2016-02-20. ^ "Heliopora coerulea". International Union for Conservation of Nature and Natural Resources. Retrieved 2016-02-20. ^ "沖縄本島で観測史上初のみぞれ　名護". The Asahi Shimbun Company. 2016-01-25. Retrieved 2016-02-20. 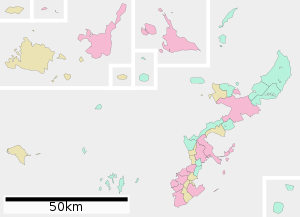 ^ Okinawa Prefectural reserve cultural assets center (2006). "陶磁器から古の神事（祭祀・儀式）を考える". Comprehensive Database of Archaeological Site Reports in Japan. Retrieved 2016-09-02. 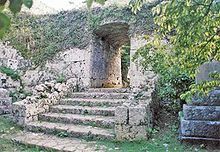 ^ "Okinawa's Longevity Lessons". Blue Zones. Admin. Retrieved 29 September 2015. ^ "ICLC Japanese Language Institute". GaijinPot Study. Retrieved 2019-02-01. ^ "Ryukyu Corazon". Ryukyu Corazon. Retrieved 2014-08-05. ^ a b c Stephen Nessen (4 January 2011). "Okinawa U.S. Marine Base Angers Residents And Governor". Retrieved 19 August 2014. ^ Eric Johnston (28 March 2006). "Okinawa base issue not cut and dried with locals". The Japan Times Online. Retrieved 21 November 2014. ^ Isabel Reynolds; Maiko Takahashi (January 13, 2015). "Japan cuts Okinawa budget after election of Anti-base governor". Retrieved 21 November 2014. 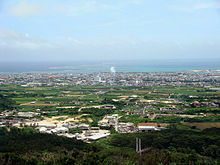 ^ "Gov't cuts budget for Okinawa economic development". January 15, 2015. Retrieved 4 February 2015. ^ "Okinawa looks to offer more unique venues". TTGmice. September 6, 2012. Retrieved 15 November 2012.